The Torture Debate: Disbar the Lawyers? 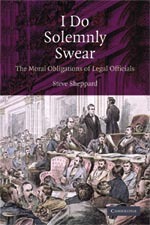 Steve Sheppard, author of I Do Solemly Swear: The Moral Obligations of Legal Officials agrees. For Smith, the Oath of the elected or appointed official to uphold the Constitution (violated in this case) is among many tools in place to keep such aberrations at bay. Smith stands explicitly against “retail justice,” arguing that officials have a moral as well as a legal obligation.